First off, I have to share the wonderful goodies I got from Kim of Kim Knits, thanks to a lovely swap arranged by Kathy of Compassionknit. Kim is so smart. The swap was a no-yarn swap, so Kim included needles! It seems so obvious, but it never occurred to me. Of course, the first thing that occurred to me was chocolate, but that's another story! I love the little notebooks she included. It's just perfect for keeping in my knitting bag and tracking details about my projects. And she noticed that I am a sucker for all crafts, so she sent a needle-felting project. It's a little hamster and just adorable. I'm thinking it would be perfect for Thankgiving weekend! 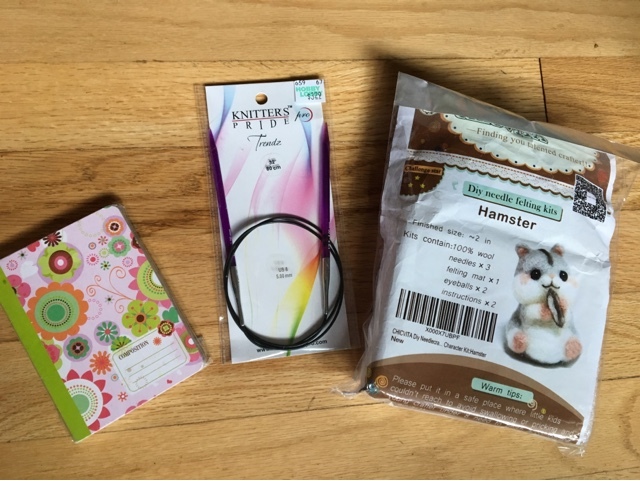 Thank you so much, Kim, for such fun and thoughtful gifts! 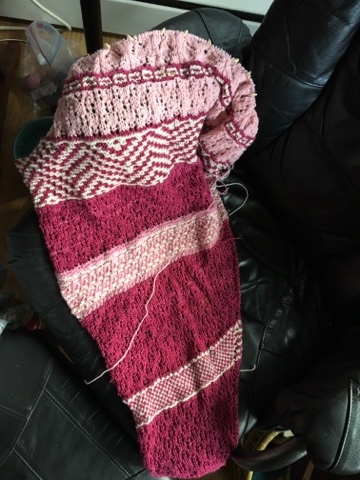 As for knitting, I've been unusually monogamous and managed to add quite a bit to my TTL Mystery Shawl 2017. I ordered the light pink online because I couldn't find anything that seemed right locally. It's OK, but a bit too pastel for me. I'm about 20% through the final clue; I will finish this! 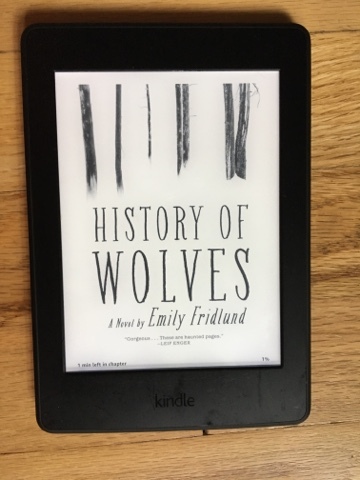 I just finished History of Wolves, a first novel by Emily Fridlund. It's a coming-of-age novel set in northern Minnesota. 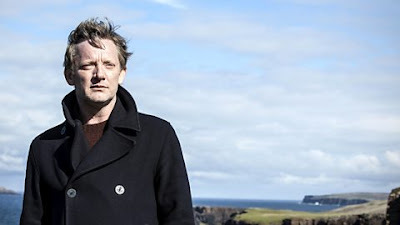 It's much more nuanced that your usual COA novel and well-written. In this book, a teen-age girl who is being raised by her hippie parents on the site of a failed commune begins baby-sitting for an affluent family that moves in nearby. The plot is not what you'd expect. I found this novel quite gripping. That just leaves me reading non-fiction for now. Being Mortal by Atul Gawande, a doctor, looks at death and end-of-life issues in America -- and what a mess it is! Not a cheerful read, but very thoughtful and thought-provoking. My father moved into Assisted Living a few weeks ago, so this has special resonance for me. 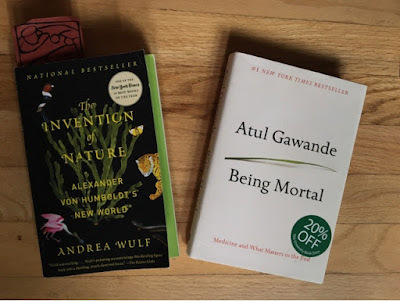 I've just begun The Invention of Nature by Andrea Wulf, which is about early biologist Alexander von Humbolt, and it is fascinating and really well-written. I'm looking forward to getting deeper into it. 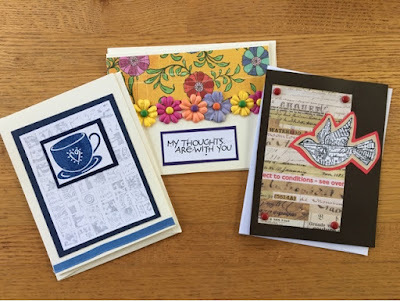 Please do join us for Unravelled Wednesday with Kat! I'm still slogging through the Through The Loops Mystery Shawl 2017, but the KAL is over. 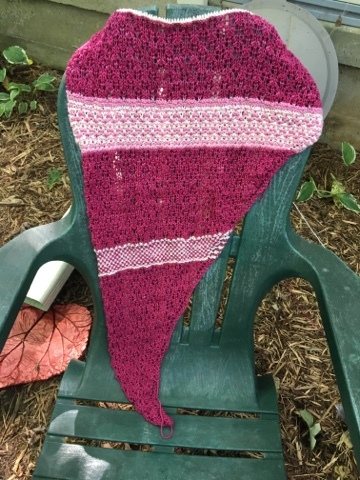 Designer Kirsten Kapur has renamed the project "Fugue in Mosaic Minor," and is it for sale on Ravelry. I was halfway through Clue 3 out of 5, so I figure I'm about halfway through it. 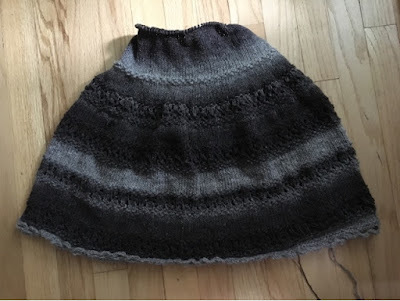 Now I've seen photos of the finished shawl, and it is pretty stunning. Can you see my mistake here? There's an extra pink ridge at the top of the mosaic section. I'm OK with it. One of the nice things about it is that there are four mosaic sections, each one more challenging than the one before it. 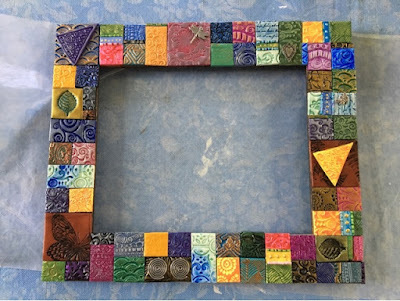 It's like a mosaic tutorial. 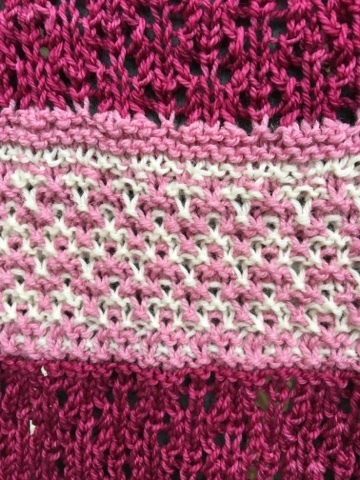 If you are interested in the pattern, you can find it here. This is my trip knitting, but I don't know how much I'll get done. My main focus is on the art quilt I need to finish for a show this winter. Did you see it? 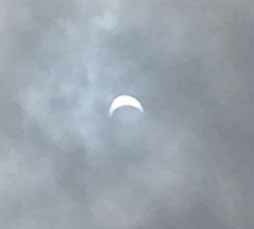 We aren't in an area to get the maximum effect, but Keith was able to capture the partial eclipse today without hurting his eyes. This photo was taken at 1:15 this afternoon in Fish Creek (Crick to the locals) in Wisconsin's Door County. 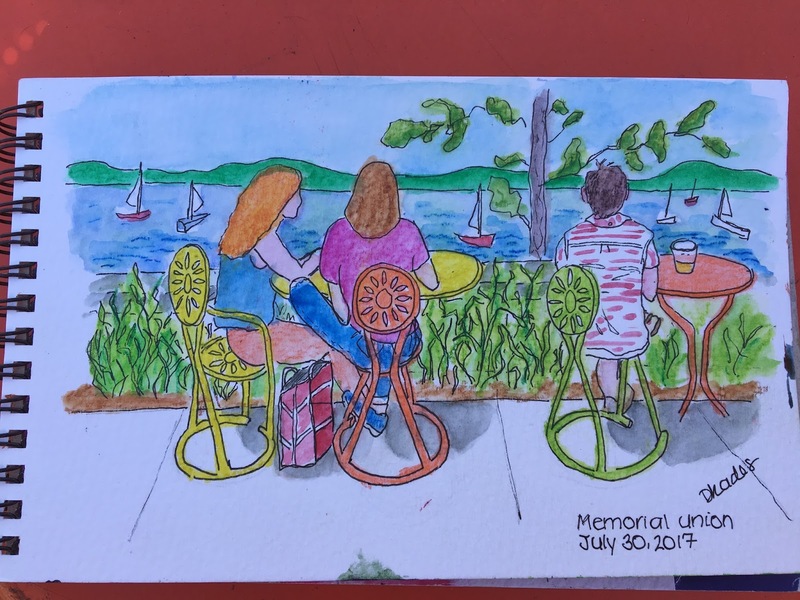 If you've been reading this blog for long, you know that Keith and I LOVE Door County. This time, we stopped in Oshkosh to see an art exhibit by Native Americans. That exhibit was good, but we were even more enchanted by an exhibit called Wonderland. I had seen this mentioned on the Internet and had no interest at all. But it turned out to be fascinating. This is a photo, not a painting! This is one of 75 images carefully crafted and shot by British photographer Kirsty Mitchell. The exhibit includes films that show how she put these photos together -- and they are just amazing. She created a sort of fairy tale to deal with her grief after her mother died, and ended up with the most successful crowd-sourced photography project ever. You can see more about Wonderland at her Web site here. There was a beautiful book for sale at the Paine Art Museum in Oshkosh, but it costs $150. Maybe my public library will buy a copy! I am looking forward to enjoying this last week before I have to report to school. We are happily settled into Tuckaway Cottage just north of Ephraim, and the weather forecast is excellent. I hope you are having a lovely week, too. I have a large collection of rubber stamps from my scrapbooking days. I've tried to sell them without success (but I'm open to ideas of how to do so!). 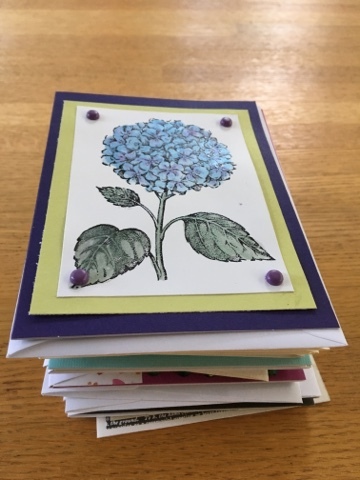 Given the prices of greeting cards, I've been wanting to sit down and make a huge number of cards -- for free, as I paid for all the supplies years ago. I finally did it this week. Given how many supplies I have, I invited friends to join me. Four friends came over, including Ilana and her new baby, Tal. 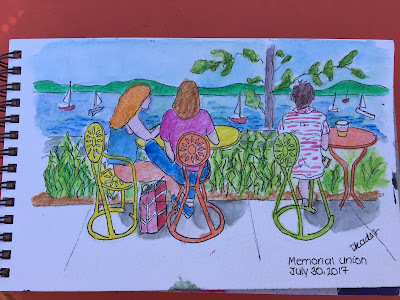 I was too busy teaching techniques and holding Tal to take photos of the gathering, but I do have photos of some of my cards. They are very basic by today's standards. I don't have a Cricut or any cutting system beyond scissors. I don't have the patience to do a whole lot of cutting. But I do have some nice cards, sparkly watercolors, papers, and brads. 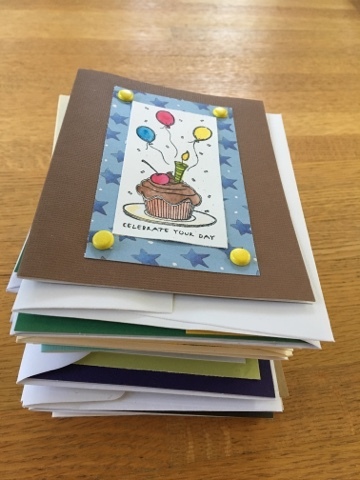 I made 32 cards over a 24-hour period. If you assume a modest card costs $4, that's $128-worth of cards. I would have made more, but we really needed our dining table back! I got a lot more making done when I was alone, but it was a lot more fun when my friends were here. There hasn't been a lot of knitting here lately. I've been putting in a lot of time at school, and we've been visiting my dad in rehab. We're hoping he'll be able to move to Assisted Living next Thursday. I've made some progress on my Winter Ridge Cowl Shawl, which is really a poncho. It has been perfect for watching Shetland, a BBC series that streams on Netflix. How did I miss this for so long? One plot is set on Fair Isle! The settings are just gorgeous, and I'm half in love with the detective, too. If you haven't watched this yet, you are in for a treat. Note: I tried reading the books, where the whole series began, and I didn't like them. 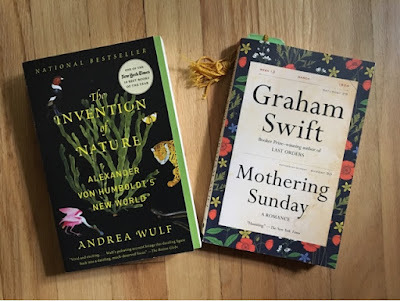 I finished Graham Swift's Mothering Sunday, and it's OK. It is short and sweet and thoughtful, but not so engaging that I loved it. I finished The Trip from last week, about Andy Warhol, and I liked that, too, but didn't love it. It really brought home that his image was completely crafted and false. He in interesting, though! Next up is The Invention of Nature, by Andrea Wulf, which is about the early biologist Alexander Von Humboldt, who did pioneering work in South America in the 1800s. 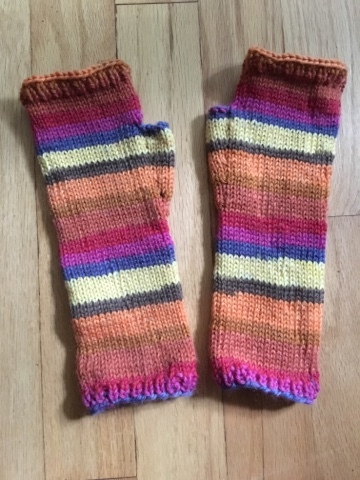 They are Stripey Fingerless Gloves from Patternology, which is the brand that the Knitting Tree owner uses for her designs. In a brilliant move, she doesn't sell the patterns; instead, they are free when you purchase the yarn each pattern is designed for. The mitts and hat are going to be gifts for two different people, however. I have had too much time to knit. Someone -- not me, for once -- backed a car I was riding in into a post and aggravated my highly arthritic neck. 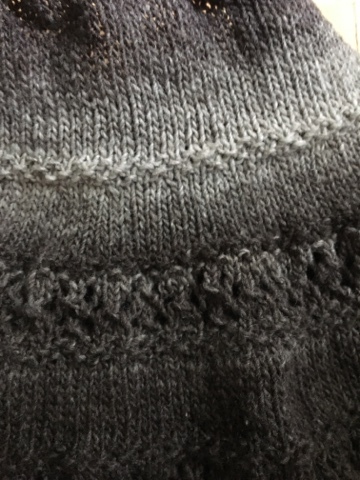 Knitting in a neck-friendly position was my main activity this weekend, along with experimenting with pain-killers. Gee, I sound so old here! I'm off to catch up on your blogs. That's one other thing I can manage! Our Internet is out. We are trying to change companies and the old one is gumming up the works, so here I am! 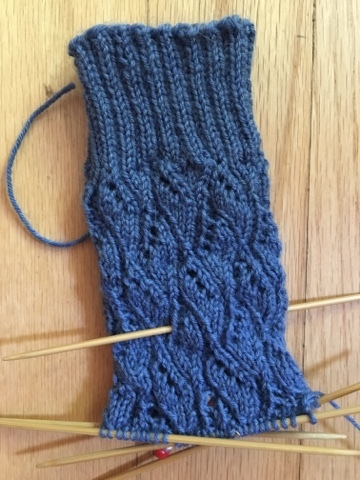 I decided that I need to start working on my travel sock at home, seeing as I had to cancel most of my travels this summer. 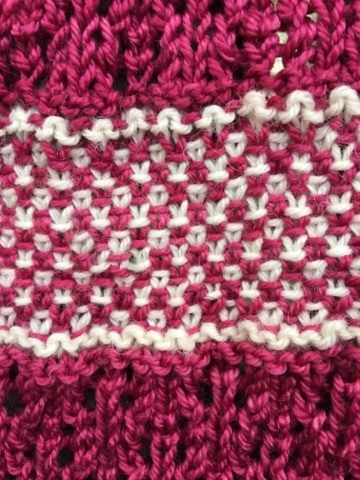 Some progress has been made on the first Almondine, an Anne Hansen pattern from the the book, Sock Knitting Master Class. 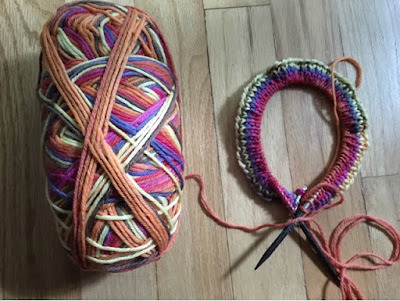 The yarn is Cascade Heritage, a very dependable sock yarn. Affordable, too. The Trip: Andy Worhol's Plastic Fantastic Cross-Country Adventure is itself a trip. It's a fast read about his early career and a car trip to his first Los Angeles exhibit. It's hard to believe he lived such a crazy life with his mother as a housemate! I'm not a huge fan of his work, but his life is very interesting. 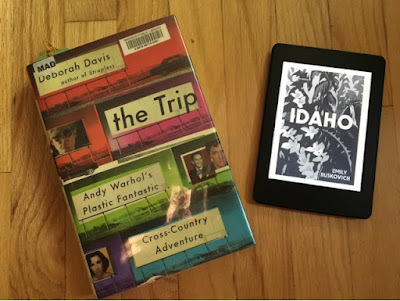 Idaho is a literary novel with a mystery embedded. The writing is a bit flowery for my taste; sometimes I feel like the author is trying too hard. The intricate plotting holds my attention, so I'll definitely finish this. I should add that it involves a couple characters with dementia and is overall fairly depressing. ... when I don't blog for more than a week. My dad has been complaining of back pain. He's also been having a lot of trouble with mobility. So, we made arrangements for him to move into the assisted living section of the retirement community where my parents live. Yarn bombing downtown Madison! I love this. But before we could get him moved, he ended up in the emergency room. Turns out the poor guy has a compression fracture in one of his vertebrae. He'll need a stay in rehab before moving into his new digs. I've been embroidering a lot of ocean stuff lately. 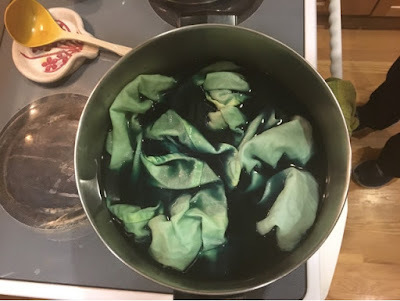 In between that, I've put in quite a few hours getting ready for school, and we are trying to make some progress in decluttering our house so we can put it on the market int he spring. We don't want to move far, just to downsize. There simply aren't enough hours in the day, are there? Joni and did lots of different crafts during her visit last week. 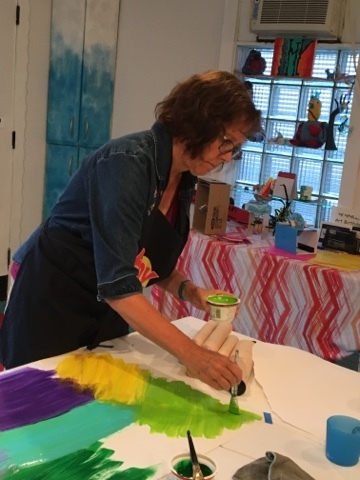 We took a great class at Bare Knuckle Arts, where we made paste paper and marbled paper. Sadly, the color almost completely washed out! Now we have off-white shirts. Is there some way to fix the color? 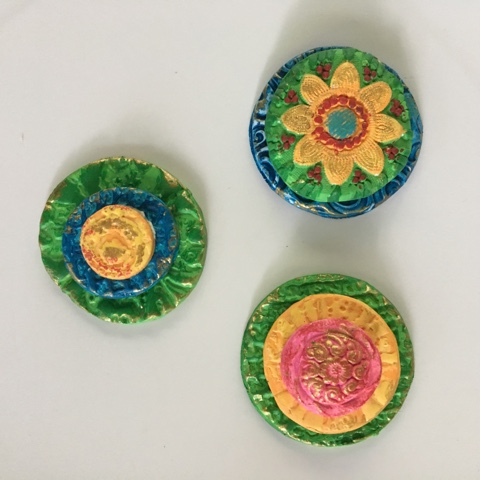 While she did that, I painted some handmade polymer clay pendants that I made a while ago. 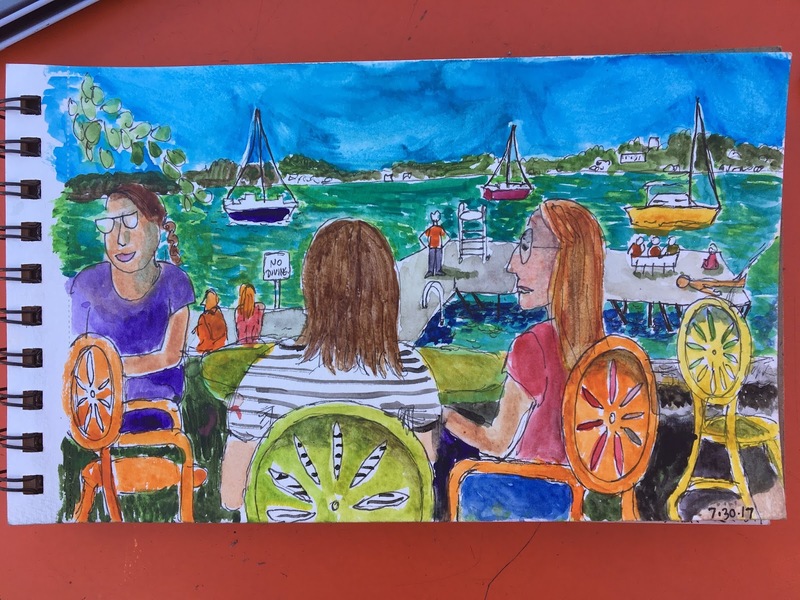 Art/craft and friends are a pretty amazing combination!